As I was reading Sue Kimmel’s latest article in the September/October Knowledge Quest (2013), it occurred to me that food, or imagery about food and food preparation epitomize the work that we do as teacher librarians. No kidding, think about it. We relate to the underlying axiom that plentiful, tasty food is a pleasurable experience for all humans. Food, especially chocolate, can break down barriers and open up social interactions that lead to meaningful understandings and relationships. What we offer in the school library program is access to food for the brain, and a place to partake of those yummy morsels in a social setting. Am I being too corny??? Joking aside, Sue’s message from “Pass the Chocolate-Planning with Teachers,” paints a picture of a successful sustained plan for collaboration with colleagues in the elementary school where she was a school librarian. In regularly scheduled planning meetings in the school library, the team of teachers and librarian came together to talk and plan instructional opportunities for their students. She explains the year long experience, and the various processes that can serve as a model for other school librarians who are looking for fresh ideas for expanding collaboration in their schools. Central to the planning process, which produced patterns of activity which she labels-orienting, coordinating, making connections, and making sense-was an observed activity that she calls “drifting.” “Drifting might be considered off task, but it represents one of the ways that team members get to know each other when personal or family information is shared.”(49) That happened when someone would say, “pass the chocolate.” Social bonds and commitment to the group are important keys to moving the planning forward. Food and humor provide a respite from the mental hard work of planning, and a time to drift off topic before refocusing on the task at hand. In this hectic, data driven world of education, it is refreshing to remember that we have to take time to drift. Our students need this time, too. Deep, real learning is hard work. When I see teachers and students who are scheduled by the minute, I wonder if we are not taking enough time to reflect on learning for either group. Social interaction, with or without food builds community and leads to shared experience for learning. I used to tell students in my school library, “Look around you. Think about this place as a candy store for your brain. Sample all the different flavors and have a feast.” As most school librarians, I always had M & M’s or something to share in my office, too. Monthly faculty pot luck breakfasts or lunches happened in the library media center, and opportunities to build community and collaboration often resulted from them. I have to admit, I have always been a foodie. And remember what Joyce Valenza has been saying for years, “Think of the library as more of a kitchen than a grocery store…” See what I mean, fellow foodies! Kimmel, Sue. 2013. “”Pass the Chocolate: Planning with Teachers.” Knowledge Quest. 42 (1) : 48-51. My students in my Instructional Design and Development course have been spending the past month observing school librarians conducting instruction at various levels and on various topics. They also spent time interviewing the school librarian about what they observed and their collaborative practices. It has been interesting to see the varied experiences they have had. I also had a few students who have interests in other areas, such as academic and public, which brought a new dynamic and perspectives to the course. Last night students shared a takeaway from their observation – things they saw that surprised them, things that worked, and things that didn’t work. I was especially glad to hear them talk about seeing practices they had read about and learned about in class in action. They commented on the importance of the school librarian knowing the school’s, the district’s, and/or the state’s curriculum and the difference this can make in what the school librarian is able to do in regards to collaboration and instruction. Several of them mentioned the importance of relationships they observed between school librarians and teachers and the sense of trust. Whereas the students that observed new school librarians noted that they were still trying to build these relationships necessary for collaboration. On the negative side of things I was sad to hear tales of librarians who were not collaborating at all, teaching lessons on AR, teaching “library skill” lessons, and just sitting there checking out books instead of working with students that obviously needed their help. This is usually the first time most of these students have been into a school library since they were in school as K-12 students themselves and I am always interested in the fresh perspectives on practice that they return with. Several students commented that when they interviewed the school librarian about collaboration and instruction is became a type of self-reflection process for the librarian resulting in the school librarian questioning their own practices. It makes me wonder how often do we really reflect on our own practices and take the viewpoint of what an outsider would see if they spent a day as a fly on the wall in our libraries. I was recently struck by the title of a blog post about blogging: “Isolation is now a choice educators make.” I found this title provocative, not just about blogging, as I thought about choice, isolation, and the word “now.” Choice seems to be an important aspect to Judi’s discussion of co-teaching versus coaching. Teachers and school librarians choose to collaborate, teach, and assess student learning together. Willing partners may choose to take risks together and to support each other in those endeavors. Co-teaching is a choice that we make. But isolation is also a choice. Isolation is a choice that some educators and some librarians continue to make. In libraries, we make the choice to work in backrooms when students and teachers are in our building and in our library. They find and check out books by themselves or with a clerk or volunteer. Librarians choose isolation in school buildings when they remain in the library instead of working in classrooms, hallways, or labs. Isolation is a choice if we eat by ourselves instead of in the cafeteria or teacher’s lounge. We may be the only librarian in our building but isolation is a choice if we don’t belong to listservs or professional organizations. I also find myself putting emphasis on the word “now.” The word “now” has an immediacy and urgency. Isolation is now a choice. We now have so many other choices with blogging, twitter, and other forms of social media that we can now choose whether or not we are isolated. Judy’s description of how the Vermont School Library Association used Skype and Google docs to work collaboratively is a great example of using social media tools to overcome isolation and work collaboratively and productively now. We now live in times of abundant choice. And in each moment we can choose to become engaged with each other, with teachers and staff, and with students. Can we now afford to make any other choice? I subscribe to the Teaching Channel email blast. I especially appreciate the real-time video productions posted there, especially since I am no longer serving in a school and do not work with pre-K-12 teachers and librarians on a daily basis. This recently posted video shows an instructional coach working with a classroom teacher. When I viewed this video, I thought of the differences between coaches and coteachers (as suggested in the chart in a previous post this week). Although I don’t have a series of comparison videos for coteachers working with pre-K students, I do have a series of YouTube-hosted videos taken during a demonstration lesson for an undergraduate teacher preparation program course at Texas Woman’s University in Fall 2012. These videos show how classroom teacher-school librarian coteaching can be enacted through coplanning, comodeling, comonitoring, and coteaching. I hope viewers will note the differences for the educators as well for the students. My experience, supported by research in the field, suggests that 21st-century school librarians who practice the instructional partner role are uniquely positioned to elevate teaching and positively impact learning in their schools. A Word about the Cartoon: Several years ago when I served in my first high school library, I started a graphic novel collection. These books were NEVER on the shelves, particularly during lunch when the Anime/Manga Club met to read, talk, and draw. This illustration, inspired by this genre, was drawn by Becca, a founding member of that club. I’d like to think that my super-hero work as an instructional partner had a part in inspiring her artwork as well. According to an article in the Daily Freeman, Kingston, New York spent $750K to hire five elementary and two middle school literacy coaches. 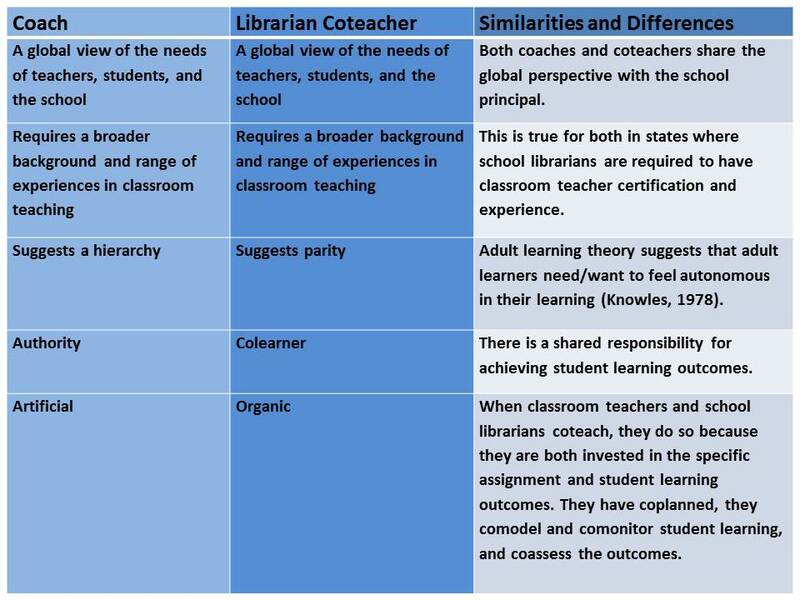 When I read the article about how these coaches help facilitate literacy across the curriculum, motivate students through research centers, and provide job-embedded professional development to teachers, I wondered why school librarians aren’t being used in this capacity. In the past ten years, while there has been a decline in the number of school librarians, there has been an increase in “coaching” positions such as instructional, literacy, reading, and technology coaches or integration specialists. I served as a literacy coach for one year. 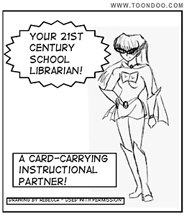 I had been a successful coteacher as a school librarian prior to taking that position. I erroneously thought I could make a greater impact on instruction through an “authoritative” role; the teachers had to work with me. I returned to school librarianship the following year because, in my experience, coteaching was more effective than coaching, most notably in terms of the impact on adult learning—mine and that of my classroom teacher colleagues. Hicks, M. A.. “School News.” Clip art licensed from the Clip Art Gallery on DiscoverySchool.com. Knowles, M. (1978). The adult learner: A neglected species. (2nd ed.). Boston: Gulf.